We’re going to be starting a new feature here on GiantsGab. Each day, we will break down every position on the Giants roster. We’ll give strengths, weaknesses, players to watch out for, etc. Today, we start with the Quarterbacks. Eli Manning: For all his early career struggles, you can’t deny that he’s a Super Bowl winning QB. After the win, he seemed to become the QB we all thought he would be, even earning a Pro Bowl nod. Problem was, when Plaxico Burress went down, Eli’s play suffered tremendously. No longer having the safety blanket to catch his errant throws, Manning look timid, not sure of himself. Not the guy you want leading your team. However, and I’ve said this here before, I think the ineptitude of the offense after Plax shot himself was more emotional, and it greatly affected on the field play. So how can Eli move on? He has to utilize all his receivers. He doesn’t have Toomer and Burress. Who will become his go-to guy? Probably Steve Smith, and they will have to develop tremendous chemistry for Eli to continue to advance as a QB. Eli has to realize that he has a tremendous running game behind him, and he doesn’t have to win games on his own. The Giants have young, yet capable receivers. I’m sure Manning will love throwing to Hakeem Nicks and his huge hands, and Ramses Barden and his 6-6 frame. 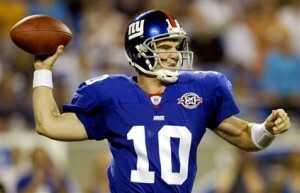 If Eli wants to be a Pro Bowl QB again, he has to do what he did before Plaxico shot himself: play with confidence. People forget that Burress was in and out of the lineup before the shooting, and the Giants still went 11-1. If he throws to Kevin Boss, if he throws to Ahmad Bradshaw underneath, if he completes long passes to Mario Manningham and Sinorice Moss, if he trusts Domenik Hixon to make plays, Manning will have a great year, and so will the Giants. David Carr: He’s everything you want in a backup; experienced, and more than capable. Carr might never see the field, as Manning has proved to be very durable. But if he’s needed, Giants fans should have confidence in his abilities to win football games. No longer playing behind the woeful offensive line of Houston, if he is called for action, he should at least be upright. That should lead to some results. Andre’ Woodson: An enigma, to say the least. He has great potential; he was once considered a first round pick during the pre-draft process, but his awkward throwing motion pushed him down. He has a long motion, with a slow release. Not what NFL QB’s need. He’s a project. The hope for the Giants is that he develops enough so that other teams are interested. With Eli seeming destined for a long term deal, Woodson isn’t the QB of the future. If he straightens out his mechanics, he might be of some trade value. Rhett Bomar: He’s in a similar situation as Woodson. He will never start for the G-Men. He has the tools to start in the NFL: strong arm, mobility. Like Woodson, his mechanics are a bit off, with a sidearm throwing motion. The goal for Bomar is to become intriguing enough for other teams. If not, like Woodson, the Giants have to hope he can become a valuable backup. 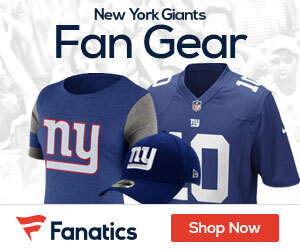 What is your take on the Giants Quarterbacking corp? Is Eli the franchise QB we all think he is? What is your opinion on Rhett Bomar and Andre’ Woodson? Up Next: We breakdown Brandon Jacobs and the running backs. If Eli goes down, does anyone think there is any chance that they still are a Super Bowl contender? Yes, Eli is good, but how important is he really to the team? The core is the running game and the D-Line, and with Carr at the helm, the Giants wouldn’t be much worse.